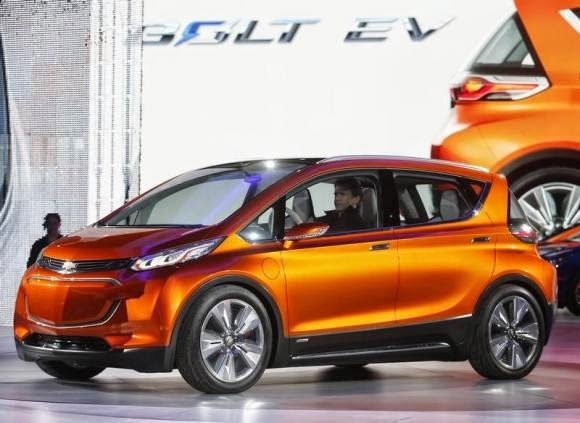 General Motors plan to begin building its new Chevrolet Bolt electric car in October 2016 at an underused small-car plant north of Detroit, two supplier sources said. Despite the hype surrounding the car's unveiling last month at the Detroit auto show, the sources said, GM's production target for the Bolt is relatively modest, at about 25,000-30,000 cars a year. Last year, GM sold 18,800 Chevrolet Volt hybrid electric cars. The Volt, priced from around $35,000, uses a small gasoline engine to increase range. GM has said the Bolt's target price was $30,000. A GM source familiar with Chevrolet's plans said the price would actually be "in the mid-$30,000s" but federal and state incentives to purchase "green cars" would reduce the consumer's final cost to $30,000. The Bolt is expected to go on sale in early 2017 and will have a range between charges of more than 200 miles. The Bolt will compete with Tesla Motors Inc's similarly priced Model 3, planned to debut in calendar 2017, as well as the Nissan Leaf, which sold just over 30,000 last year. The supplier sources said the Bolt and a companion model for GM's Opel subsidiary in Europe will be assembled at GM's plant in Orion Township. The GM source said the company has not yet reached a final decision on whether the Opel model will be assembled in Orion Township. The factory now makes the Chevrolet Sonic and Buick Verano and has been operating at well below capacity as small-car sales have suffered from falling gasoline prices. The Bolt is being developed on GM's Gamma global small-car platform, according to the supplier sources. The same basic set of components will provide the base for the next-generation Sonic, also due in late 2016, they said. The GM source asked not to be named and an official company spokesman declined to comment. The Bolt is great idea however, GM's problem is not the car it's their fast charging infrastructure..... they don't have one! Their electric car is about as useful as a crossing guard without a stop sign even though it's orange.